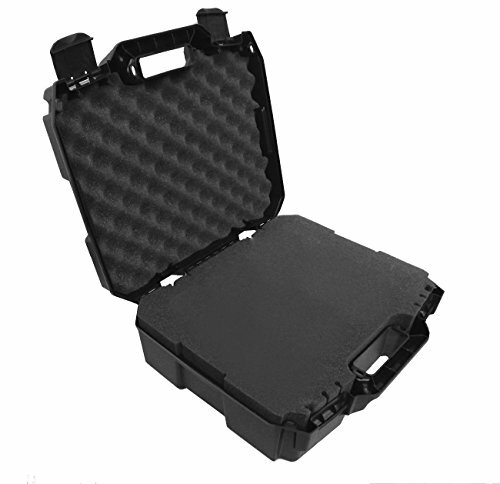 The exterior structure of this heavy-duty travel case is made of a highly durable polypropylene mixture for strength and integrity. The dense foam interior is arranged with a Top Convoluted (Egg-Crate Shape) Lid of 0.75" thickness, a Customizable Pick & Pluck (Diced) Core of 3.375" thickness, and a Solid Basin Pad of 0.675". High-impact resistance in the exterior shell, coupled with a dense, shock-absorbing foam interior, protects and secures your Water Pipe and Accessories from all angles during storage, travel and transit. Measuring 16.0" x 13.0" x 6.0" in external dimensions, with total usable interior space at 13.0" x 10.0" x 4.5", this case easily accommodates Glass Waterpipes. It Includes a convenient carrying handle for easy transportation and four padlock holes for security. Discreetly Transport your water pipe and accessories during travel or keep safely locked and stored at home. The heavy-duty latches securely snap down to hold the case shut. The 3.3" foam base consists of individually pluckable dense foam cubes. The Foam core is easily customizable to fit your Glass Pipe due to the high-density ELE foam. This allows you to create separate compartments for one 12" 1 Foot Water Pipes , Downstems , Bowls , Canisters , Grinder and More. This prevents your accessories from rubbing and provides superior internal impact protection. Fits 12" (1 FOOT) Glass Beaker , Tower with Stems , Mouthpieces , Catchers , Bowls , Perculators and Accessories such as Grinders , Canisters and More! NOTE- INTERNAL FOAM IS CUSTOMIZABLE WITHIN 13.0" x 10.0" x 4.5" - Make SURE BASE IS NO WIDER THAN 4.5" AND NO LONGER THAN 12"
Hard shell prevents your Water Pipe and Accessories from being crushed. Internal tri-Layer foam cushioning with Pick & Pluck customizable middle layer protects from impacts and drops. Individual Cubed Foam Interior allows separate compartments to be created within maximum internal dimensions of 13.0" x 10.0" x 4.5" . Exterior outer dimensions measure 16.0" x 13.0" x 6.0"
If you have any questions about this product by CASEMATIX, contact us by completing and submitting the form below. If you are looking for a specif part number, please include it with your message.